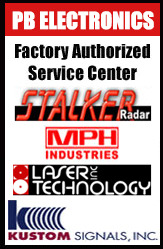 Used Refurbished and Reconditioned Sports Radar Guns for sale. 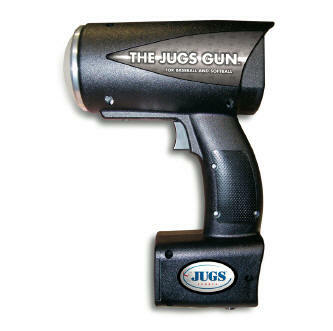 All Radar Guns with 1 year warranty! • Operates in two user-friendly modes—Trigger mode and Continuous mode. Trigger Mode:Pulling the trigger reads the speed of the pitch. Speed remains on the radar gun for the duration you set in the menu. Default is 5 seconds. Continuous Mode:Pulling the trigger twice reads the speed of the pitch automatically, then clears itself to read the speed of the next pitch. • FAST,LAST and FAST/LAST Functions:FAST captures readings at the release point. LAST captures readings at the plate. FAST/LAST captures both. • Five pitch recall: You can view the last five pitches thrown with the recall feature. • Data port for transmitting data to a display or computer. Generally used by Youth Leagues, High Schools, Colleges and Professional Teams. Stalker SPORT Hand-held Sports Radar with DSP technology. Mint condition and Refurbished to original factory specs and range with 1 year warranty. The 4 digit, liquid crystal display (LCD) shows the speed to 1/10th MPH (or KPH). The display "icons" confirm various settings and operational status. The LCD provides high contrast daytime readability, while the backlighting provides excellent night viewing. When tracking pitches, a peak speed setting will show the "out of the hand" reading. This is the most consistent and common place to measure the speed. If you want to see what the speed was as it crossed the plate, just turn off the peak hold. After the pitch, you can "toggle" back and forth between peak and plate speeds to view both. The Peak Hold feature allows the gun to automatically hold or recall the peak speed. It keeps both the continuously tracked speeds, and the peak speed in memory. Even after a tracking, you can refer back to see the peak speed or the last speed. Stalker PRO "Professional" Ka BAND Stationary Hand-held Sports Radar with DSP technology. Mint condition and Refurbished to original factory specs and range with 1 year warranty. 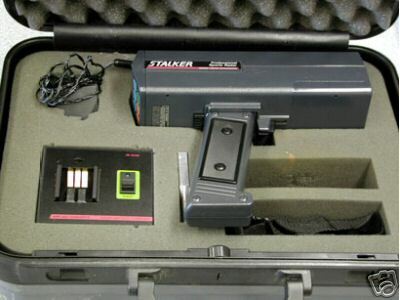 The Stalker PRO can be used for any type of sport or testing application. The incredibly fast sample rate, high frequency, and extreme sensitivity, enable it to work in very difficult and unusual applications. This design provides exceptional performance for watercraft and snowmobile testing where water spray or snow dust render ordinary radar guns useless. Reads in MPH, KPH, or Knots in 0.1 increments at the touch of a button. 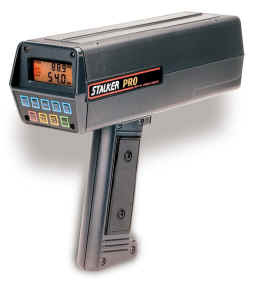 The Stalker Pro was designed to be best radar gun in the world in terms of performance, quality, and features. It boasts the most sophisticated microwave systems in the industry, a high speed DSP computer utilizing elaborate target identification programming, and the most features ever stuffed into a radar gun. The Stalker Pro is the highest performance sports radar in the world by a wide margin. The real draw of the Stalker PRO is it's performance. The PRO is able to measure the speed of objects with true accuracy to 1/10th MPH, across a wide speed range, even when the objects are very far away. It can see cars well over a mile away, personal watercraft in excess of a quarter mile, and it can track pitches from most center field bleachers. The Stalker PRO can even pick off a mosquito from several feet away! The PRO features a nine-button keypad and a backlighted LCD screen with twin, four digit readouts. By using two separate speed displays running simultaneously, both the continuously tracked speeds and the peak speeds can be shown together. 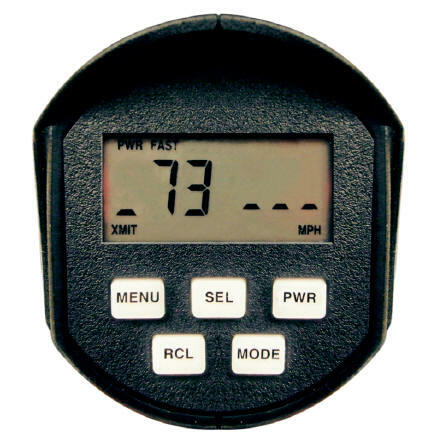 For baseball use, this system shows both the release speed and the plate speed together on every pitch. For vehicle applications, the separate display for peak speeds allows the operator to see how the peak speed compares to the continuously tracked readings. Although most major league baseball teams like the simplicity of the Stalker SPORT, a number of teams use the PRO for advanced scouts and in player development. The twin readout display provides instant feedback on the difference between release and plate speeds. Plus, the Ka band microwave system provides nearly total immunity from interference in most stadiums. • Target Acquisition Time: 0.01 Sec. CLICK PB SPECIALS ABOVE! Special sale through End of the Month. Hundreds of dollars off of select models.